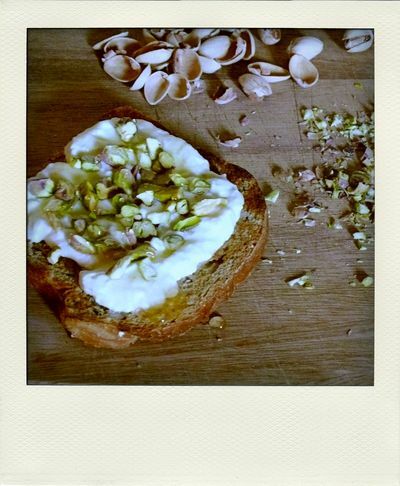 this idea stems from an old wish magazine recipe for ricotta, pistachios and honey on bread. to try and make it a healthier breakfast alternative, i let a couple of tablespoons of yogurt sit in a cheesecloth-lined strainer, and in the time it took me to chop a handful of pistachios and toast bread, it was as creamy and thick as any ricotta. i drizzled my slice with some heated raw honey and the whole thing disappeared in about 1 minute flat.